As The Astronomer and I strolled from ChikaLicious back to the hotel, we stumbled upon the Wafels & Dinges truck at Astor Place. Even though I had just consumed a hefty Italian dinner followed by a three-course tour de sweets, I couldn’t resist stopping for a taste. I live a gloriously gluttonous existence while on vacation. Plus, I didn’t know if I’d run into the truck again. Belgium native Thomas DeGeest launched Wafels & Dinges in 2007. Since then, it’s grown into a mini waffle empire complete with one roaming truck, two roving carts, and two permanently parked carts in Central Park. The truck even has a hotline for waffle seekers to keep track of all the action. I’ll admit it, I was so intent on trying this truck that I programmed the number into my phone before leaving town. I am a waffle lover through and through. 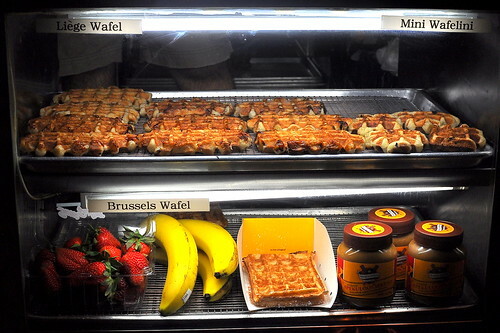 The truck offers three different kinds of waffles: Brussels, Liège, and mini “wafelini.” There are also a plethora of “dinges” including fresh fruit, butter, maple syrup, and whipped cream. I had my sights set on the Liège waffle with Speculoos ($5). The service on board the truck was extremely efficient; only thirty seconds passed between placing my order and having it in my hands. I probably should’ve listened to Ed Levine and insisted on a freshly made waffle, but I took what I was given and dug right in. While the waffle’s flavor was very good, its texture and temperature were compromised from sitting under the truck’s florescent lights. I like my Liège waffles served up hot with crisp and caramelized edges, a flaky interior, and plenty of pearl sugar to gnash in between my teeth. This one wasn’t terrible by any means, just not as awesome as it could’ve been had it been freshly made. Lesson learned. Listen to Ed. 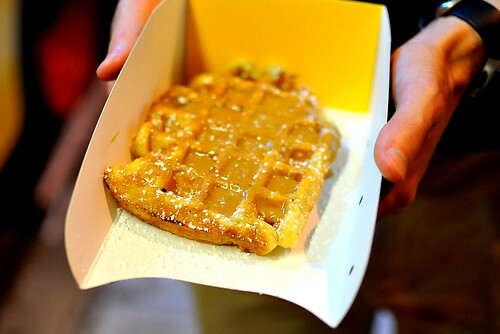 Follow Wafels & Dinges on Twitter @WaffleTruck. 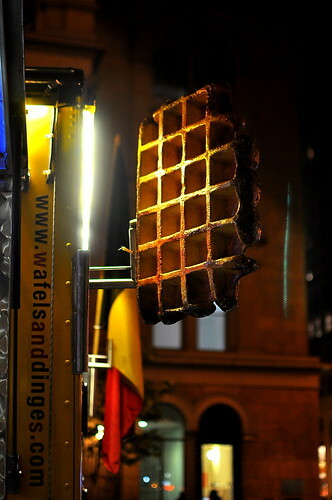 Looking at the pic of that waffle & the one customer, it looks like it and the waffle truck have had better days. Reminds me how very rare it is to find waffles worth the price. Mike – There were actually lots of people around the waffle truck. I used the image of the man and his bike because I liked the composition and mood. Weez – Girl, it’s all about the fiber. And mileage! I’m stuffed just reading about your food adventures! I’ve heard of this truck also and how crazy popular it is. Bummer it wasn’t as awesome, of course this means you have to hunt it down before you leave and have a fresh one! Hi, Cathy! Have you tried Waffles de Liege here in SoCal? 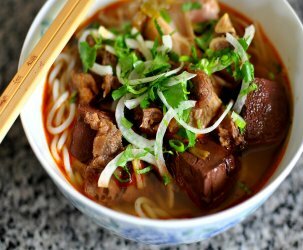 Had to wait 20 minutes for my order at South Bay Din-Din-A-Go-Go, so it was freshly made. The interior texture was sort of like a denser croissant. 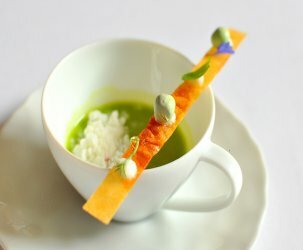 Mr. DG & I enjoyed it, but we have no other experience to compare it to for authenticity. Hi Cathy! I absolutely love reading your blog, and when I saw Wafels and Dinges in your title, I was extreeeemely excited for you to partake in one of my favorite trucks of all time. I am so disappointed you didn’t get a freshly made waffle. They are extraordinary. And I would recommend supplementing your speculoos with strawberries. The tartiness is a good match to the sweetness of the speculoos. I do hope you’ll give Wafels and Dinges another chance to win your heart over! 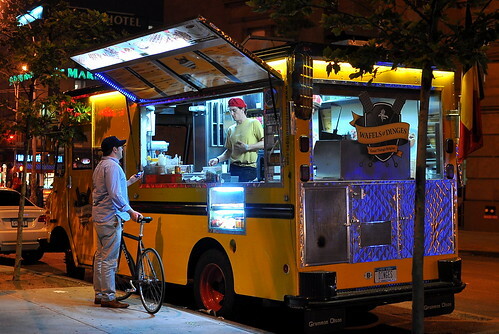 Tina – I’ll definitely revisit the waffle truck on my next visit to NYC. 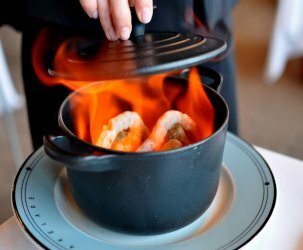 I could taste the potential on my first visit 😉 And thanks for reading! whooo you crazy kids… I know I would never order anything named speculoos, it sounds too much like a dreaded medical device and makes me cringe! On 4/18/14 I was going Time Sq. with two other friends. We stop by at this yellow food truck called Wafels and dinges. We got three waffles that cost $19.00. It was small for the price we paid. After getting the waffles I took a bite, let me tell you this it did not taste good so I try it again. I was very bad sour foul taste! I thought it was just my but both of my friends said the same thing. How can you go wrong with waffles! We all trash the waffles after small bites. Disappointed!!! Wasted $19. Dollars. Dot eat at Wafels and Dinges! Save your Money!!!!!!!! !